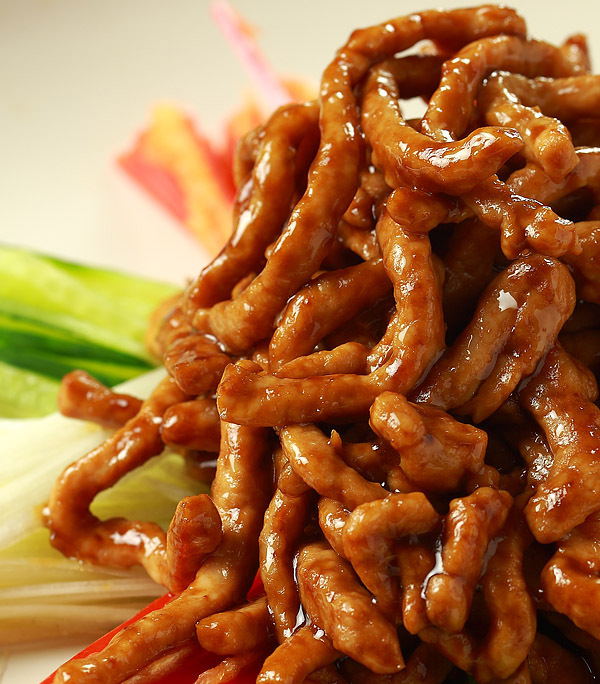 Peking pork (Beijing pork) is very popular in China, especially in the North of China. It is moderately sweet, with a rich sauce and a unique flavor. In the 1930s, Chen Laohan, who was originally from the Northeast, lived with his grandson and lived by selling tofu. One day, the grandson wanted to eat at the roast duck restaurant, but Grandpa didn’t have the money, and he promised to have money for the New Year. However, by the end of the year, life was still difficult. Grandpa stir fried pork with noodle sauce and served with raw shallots. The result was like roast duck, and the grandson was happy to enjoy it. After the grandson grew up, he went to the Quanjude apprenticeship and became a good cook. 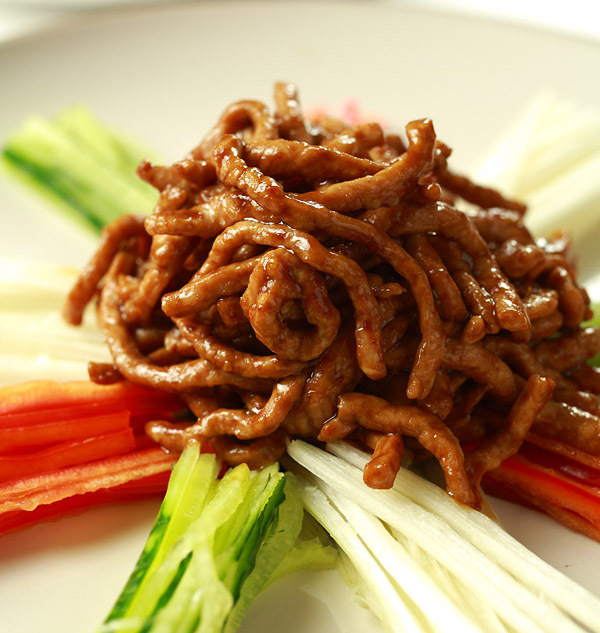 After Chen Laohan’s instructions, his grandson improved the family dishes along with the shredded pork with peking sauce. In this recipe, the Peking sauce refers to the Sweet Bean Sauce (tian mian jiang) that has been stir-fried. 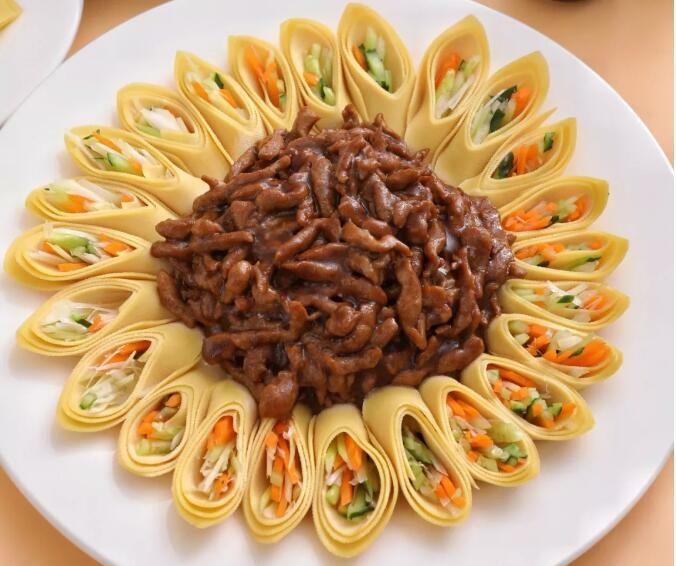 It is the most important part of this recipe: the process of stir-frying the Sweet Bean Sauce. You cook the pork separately so as to not overcook or burn the sauce, as it works very quickly. If you feel the sauce is too thick, you can add a little sugar and then stir in water. The pork used for this dish is Pork tenderloin because it is the most tender. With the other ingredients, you get the spicy taste of the spring onion, the refreshing taste of the cucumber, and the added color and crunchiness of the carrot. Mixed with the Shredded pork wrapped in tofu skin, the combination is very satisfying! 1. Cut the tenderloin into thin strips, transfer to light soy sauce, cooking wine, Corn starch and mix well, then marinade for 15 minutes. 2. Lay out the tofu skin. Put the cut spring onion, cucumber and carrot on one side and slowly roll it up. 3. Cut with a knife and place a circle around the edge of the plate. 4. Add a small amount of cooking oil in the pot, heat to about 70% heat, add the marinaded pork, stir-fry until whitish. 5. Wash the pan, pour a little cooking oil, pour the sweet bean sauce, stir well with a spatula, then mix in salt, sugar, dark soy sauce and mix well. 6. Stir in the pork and stir fry for about 3 minutes, then add a little water starch to thicken. 7. When the sauce is rich and the meat is tender, it is finished. Place in the middle of the plate. 8. Serve with extra tofu skins and vegetables to make easy-to-eat wraps, and enjoy!